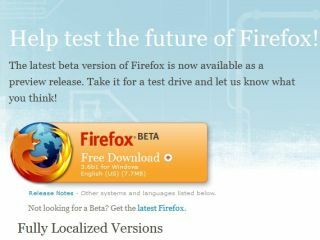 Mozilla has announced the arrival of Firefox 3.6 Beta 1 for download, introducing several new features to the web browser. Although the majority of the tweaks are minor, Mozilla has made improvements which will make web developers, add-on developers and users happy. While Mozilla wants you all to have a play with the Beta, it does note that "this release is considered to be stable [but] it's not a fully completed product so there may be some rough edges visually and with the user experience." For more details, point your (presumably Firefox) browser to the Mozilla Blog. Or, if you are feeling feisty, you can download the Beta here.